Both the Apostle Paul and Jonah have been appearing recently in the daily office lectionary of the Episcopal Church. Both stories feature shipwrecks: the one Jonah averted by having himself tossed overboard (Jonah 1:11-12) and the one that destroyed the ship Paul was on but with no lives lost (Acts 27:21-26). Both stories suggest a way of thinking about what’s happening in graduate-level theological education today. Both stories offer assurances of God’s presence in the midst of disaster. Both stories make me wonder: Does the ship really matter? For some years now (decades?) we’ve been witnessing what amounts to a slow-motion shipwreck of seminary education. The current turmoil at the General Theological Seminary is only the latest example (read more about that here), as is the similar but less public uncertainty at Episcopal Divinity School, not to mention the closing of Seabury-Western Theological Seminary as a residential school for the Master of Divinity degree in 2008. Those examples come from my own denominational home, but similar moments are unfolding nearly everywhere in higher education. If you work for a divinity school attached to a university – especially if it’s Harvard or Yale – you may have no direct experience of all this, but everyone else in the theological world does. Each school, of course, must deal with its own particularities (and they can be quite complex, if not confounding and infuriating, as the Crusty Old Dean reminds us). Yet I am convinced that the current upheaval of seminary education mirrors a broader tectonic shift in institutional Christianity itself, at least in Europe and the U.S. Others have noticed this long before I did, including all those involved in “emergent Christianity.” But here’s the obvious question that no one (yet) can answer very well: what exactly is emerging from all this? To suppose that something is emerging at all sounds rather hopeful. But let’s be clear: the whole thing is a shipwreck of epic (biblical?) proportions. And still, I am profoundly hopeful. I have no fix-it plan for the future of theological education on which to base my hope. But I do take solace in remembering that ours is not the first generation to face moments of uncertainty and crisis. That rich history reminds me that every ship eventually wears out, or simply splinters in the throes of storm-tossed seas. Perhaps that’s the point: the ship matters far less than where we’re going, even when we can’t see over the horizon. 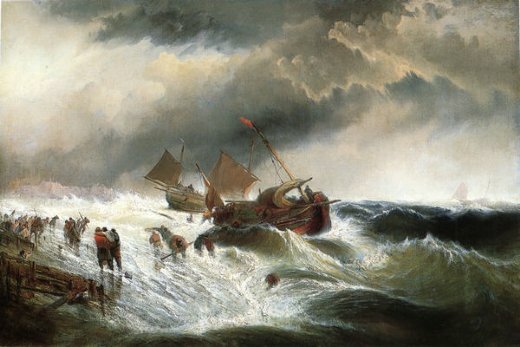 Getting to that unfamiliar shore will mean swimming for our lives away from the shipwreck, and prior even to that, recognizing that the ship is a wreck. If we do that, as Paul insisted, everyone gets out alive and actually thrives. Or, as Jonah ruefully realized, repentance matters. My therapist urges me regularly to avoid binary extremes. That seems like sound advice for Christian churches and seminaries. Most Christian churches, for example, live and operate today as if the twentieth century never happened. Seminaries have followed along that same path, forming church leaders using a model developed in the 18th and 19th centuries. That model was helpful then, not so helpful now. Or as my therapist also likes to say, that was a good coping mechanism when you were growing up, but it’s not useful as an adult. 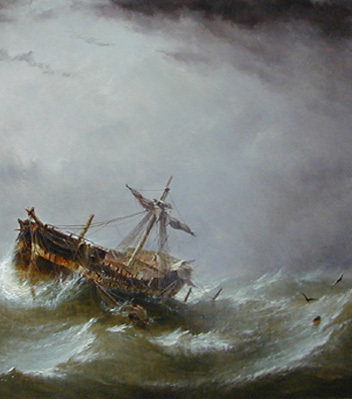 The ship carried Paul to Malta – where it was time to abandon it. I’m actually very grateful for the deep formation I received in the Anglo-Catholic tradition from my Episcopal seminary back in the 1980s. It was spiritually nourishing, theologically inspiring, and intellectually stimulating community. Indeed, I was so deeply formed in that seminary community that I really didn’t want to leave – perhaps Jonah felt the same way in the belly of a fish. Trying to replicate that seminary pattern of life as a priest in a suburban Chicago parish was perhaps not disastrous but certainly less than helpful. What then do we do with the rich legacy of our traditions in a world our ancestors never could have imagined? That question need not and should not rely on binary choices. “Formation” is not necessarily bad; the “tradition” is not irrelevant; leading and sustaining communities of counter-cultural Gospel witness is imperative. Yes, and still, we can’t keep repeating how Christians were formed in the tradition a century ago just because we don’t want to reinvent the whole thing from scratch. Mental and spiritual health will resist extremes, even when the middle way (remember that?) seems unclear or muddled. Some years ago a colleague from another seminary made some arresting observations about contemporary theological education that have stuck with me, not least this: Barthian Neo-Orthodoxy won the day in the 1960s and 1970s. Evidence of this victory infuses nearly every seminary curriculum for the Master of Divinity degree, regardless of where the school falls on the conservative/liberal spectrum. Those curricula begin with Bible, then move into Church History, and then tie them together with Systematic Theology – those are the three sources, in that order, that Barth insisted constituted the only sources for revelation. I can hear the howls of protest now, mostly from my liberal and “progressive” seminary colleagues. To which I would gently ask, why then do so many seminaries persist in that pattern? What if we began the M.Div. degree instead by taking field trips to art museums, city council meetings, and economic development organizations as if these were also sources of revelation? (I mean, aren’t they?) Following each excursion, students and faculty could engage in shared theological reflection, regardless of how biblically, historically, or systematically sound the reflection is. The academic disciplines come later, as tools for honing and refining our reflection. Useful? Naïve? Not academic enough? I don’t know, but does Barth continue to win? I actually appreciate many of Barth’s insights but continue to worry about the patriarchal and paternalistic (if not actually infantilizing) patterns of formation that so often attend that Barthian approach to theology. (Here’s just one exhortation to remember that seminarians are actually adults.) Seminary “formation” matters as we often get in our churches what our seminaries model in their pedagogical styles (and believe me, that can and does keep me up at night). We might try reshaping seminary education for collaboration and mutual goal-setting. We could do this by resetting learning outcomes every year based on the particularities of each incoming class rather than the standards set by an academy (let alone accreditation agencies) that may have little if anything to do with what Christian congregations need today. That would be scary but maybe also liberating. To be both we need constantly to ask whom we (denominations and seminaries) are trying to please and appease, and why, in the standards we set. More pointedly: Do seminaries serve accrediting agencies or academic journals or the Church? I no longer believe we can just assume to answer “all three” without caveat or qualification. Whatever “Gospel” means remains contested, and rightly so. The stakes are high. At the same time, I am struck by how many seminarians struggle to integrate their faith (including the “mystical experiences” that many of them are too chagrined even to mention) with their academic work. I know, I know: we theological academics insist that scholarly work is part and parcel of “spiritual” experience. And yes, “deconstruction” is a necessary prerequisite for a “constructive” approach to a mature faith. Yes…and, students still struggle. And then they graduate, get ordained, and lead congregations filled with people just as hungry as they are to figure out whether and how the Gospel still matters in a broken world. In particular, I worry that too many Euro-American Christians focus on the shipwreck and never ponder the island. More traditionally, the central proclamation of the Christian Testament has virtually disappeared from center stage: resurrection from death. In part, this kind of reticence about the Gospel reflects a fatal flaw in the model of theological education derived from the 19th century, when “resurrection” got lumped in with all the other “mythological” stuff that belongs to a pre-enlightened age. This fatal flaw appears in liberal circles whenever we insist that human beings always have the ability to build something new out of the wreckage of disaster. We don’t have to trot out Pelagius (yet again) to worry about that kind of “lift yourself up by your own bootstraps” theology. For conservatives, the fatal flaw appears whenever Christian communities fixate on a better life beyond the grave to the exclusion of all else. That seems like a sure and certain recipe for denigrating this planetary arena of God’s creative work. Climate change, anyone? Neither of these approaches seems convincing enough to abandon the shipwreck and swim for an unknown shore. Both of those views tend to evacuate God from the messy, joyous, invigorating, exasperating, triumphant moments of daily life. That’s precisely where most people going to church today want to find God. Do they? I do believe something is “emerging” from the detritus of modern Western Christianity. Perhaps we could still call it “Gospel” if it features Jesus rising from the dead – the central proclamation of the earliest Christians. What in the world could this mean? To see all of those moments woven into a single garment of effective theological education will mean attending carefully to both Paul and Jonah. As Paul’s ship fell apart, those who were able swam to shore; those who couldn’t swim grabbed pieces of the crumbling ship on which to float ashore (Acts 27:43-44). We need the pioneers who just jump in and swim. We also need those who see valuable pieces in the flotsam to save and preserve. Jonah, of course, resisted nearly every moment of God’s gracious renewals. He was even resentful of God’s grace to the penitent! But he nonetheless stands for a remarkable act of courage. Throw me overboard, he tells the floundering ship’s crew, and you will be saved. They did, and they were. The curmudgeons among us (and I can certainly fit that bill at times) still have something to offer to this moment, even if it’s only the courage to let God have God’s way, as Jonah (resentfully) did. That, too, counts as profound witness. Courage will, of course, mean change. It will mean changing how I teach. It will mean changing how student success is evaluated. It will mean changing seminary curricula. It will mean changing the governance structure of our schools and our congregations/denominations. It will mean changing how Christians live in the world. It means all this and more because the Gospel changes everything. It always has and always should, if it’s Gospel. I’m not prepared for those changes. No one is. And that’s the point. As Rowan Williams once observed some years ago, “The Gospel cannot be both palatable and transformative at the same time.” Paul had the same insight when he was knocked off his feet on the road to Damascus (Acts 9:1-5), as did Jonah, when he had himself cast into a turbulent sea. If the Gospel is (re)emerging from today’s tumult, it will not be comfortable. But it will be life-giving. May we be gentle with each other as we swim to shore or, as the case may be, as we are vomited up on a beach. Who knows? 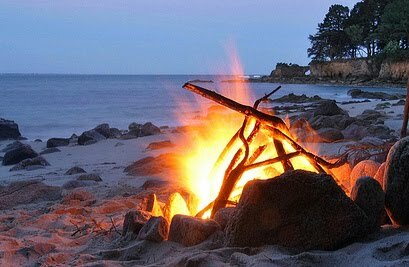 Perhaps someone waits for us there, cooking breakfast (John 21:4-14).